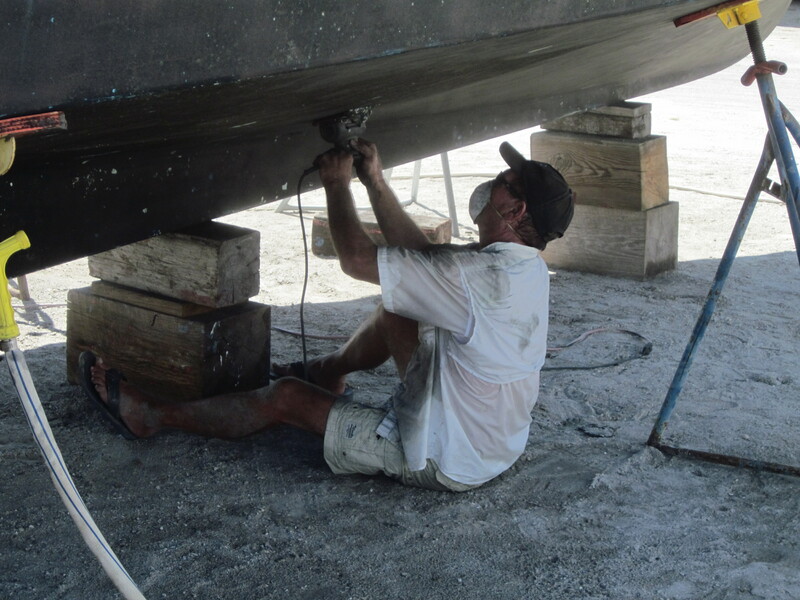 There are two boatyards in the area that will allow you to do-it-yourself. 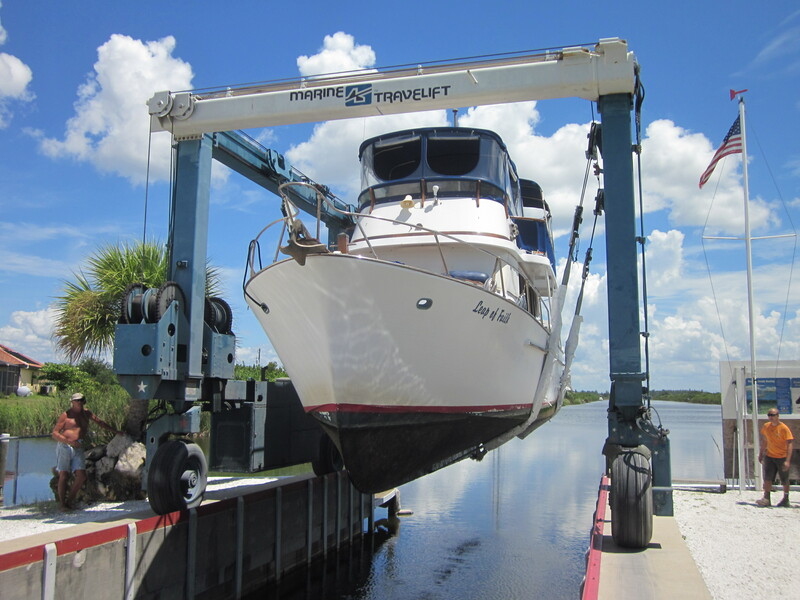 Charlotte Harbor Boat Storage couldn’t take us until November. Safe Cove (formerly All-American) could take us right away. We paid an extra $100 for pressure washing and it was well worth it. 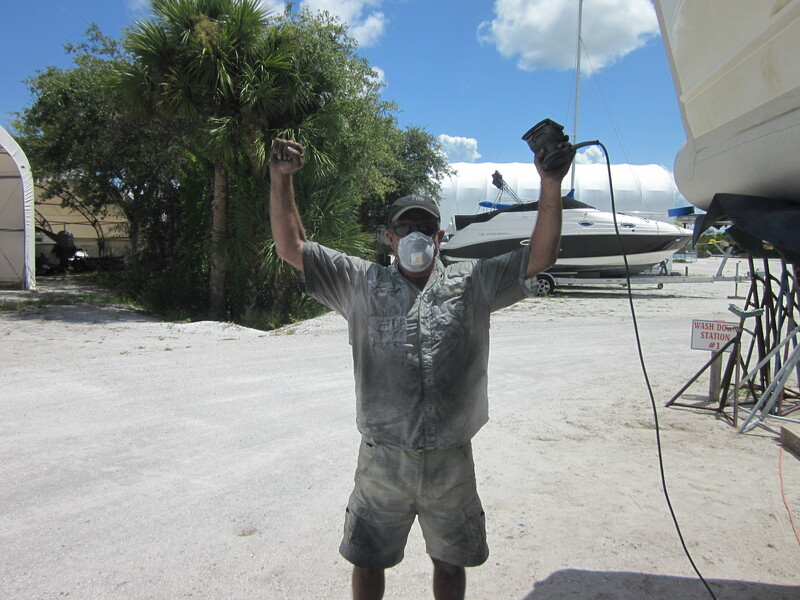 95% of all barnacles were gone before I touched the hull. I had to scrap and poke at the nooks and crannies of the running gear. I chose Trilux 33 for the metal parts. 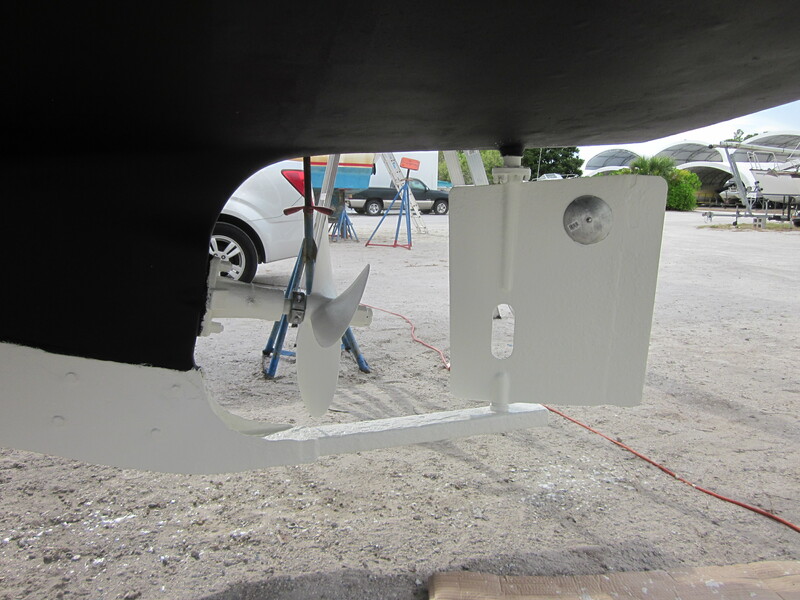 Here’s a before and after of the prop, shaft and rudder. Sanding the bottom was a horrendous job. It was hot, dusty and downright miserable. I started Friday afternoon and worked until dark. On Saturday I started work again early and finally finished at noon. I wore some old tattered clothes that I should have thrown away a long time ago. When I finished sanding they went into the dumpster. It took about 8 hours of total labor to sand the hull. I was exhausted but thrilled to be done with that part of the job. We washed it all down and took a break to let it dry. The 95 degree heat shortened the drying process. 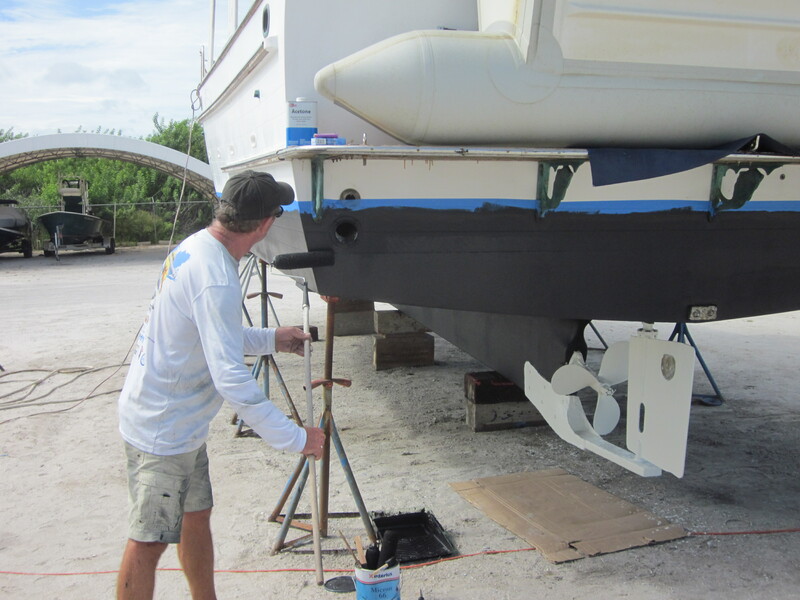 I chose Micron 66 for anti-fouling. Practical Sailor constantly tests and studies the performance of bottom paints, and Micron 66 is always the clear winner. It’s also the most expensive. Retail is $299.99 per gallon. I bought 3 gallons. The heat made paint application difficult. It dried up so fast I couldn’t spread it out. It took two full gallons to finish the first coat. I was going to need another gallon. This is when I discovered “Brush Ease” from Interlux. It’s a thinner for Interlux bottom paints. You can dilute by 10% and it makes rolling much easier. I wish I had known before-hand. I used up all my West Marine ten-dollar coupons and got another gallon for $200. This cut our overall savings on the job down to $800. Still alot of money. The second coat went on much smoother. A third coat was applied to the water line. I had the yard move the jackstands and those spots got two coats. We’d have a full 24 hours drying time before relaunch. We hauled out on Friday at 1:00 p.m. and took the tape off on Monday at 5:00 p.m. It was non-stop manual labor in the Florida heat, and I’m glad it’s over. We launch today at 2:00 p.m. If you ever wondered why it costs so much to have your bottom paint redone, I can tell you. Because it’s a nasty job. It’s pretty much the most miserable work I’ve ever done. I’m not afraid to work hard or get dirty, but I’m seriously considering paying someone to do it next time. 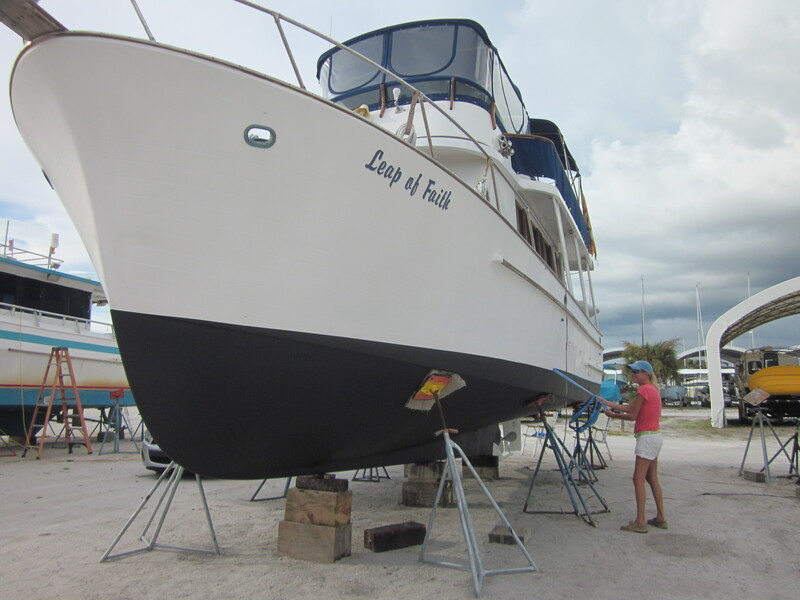 This entry was posted in Uncategorized and tagged Boat Maintenance, boatyard, bottom painting, Ed Robinson, Leap Of Faith, Liveaboard on September 9, 2014 by Ed Robinson. Great blog. My husband experienced the same as you and made the same decision second time around. 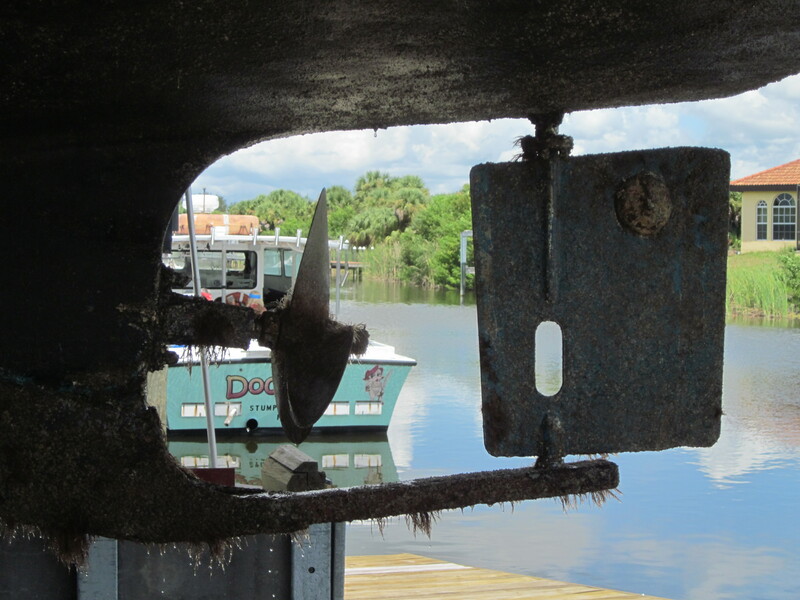 We went to Green Cove Springs from Palm Coast to save on the money hauling out and on the hard. A great painter did our bottom. But we realized what we saved was then spent in gas to get back and forth! But it was a nice trip. Nice write-up Ed. Our Trinidad Red (non-SR) is on its 4th year with barely a handful of barnacles – 4 gal 37′. Been using the same stuff over 20 yrs last four boats. In water clean once or twice a year. Hope Micron 66 does you proud – as you say, it’s not a inexpensive or fun job! I did the lite sandblast last year…works well. I’ve had very poor luck with Trinadad…will try Micron 66 this fall. Also I use PropSpeed … have it professionally applied for $90. Another consideration ref DIY…that freekin paint & dust is toxic…enough other stuff out there w/o adding more…I was a DIY guy once. ..no more. ..at 70 yo. Those days are behind me now. ..rum n coke watchin girls in pool more my idea of DIY.